Kris Kobach is the Secretary of State in Kansas and the current Republican governor of Kansas. He’s in a tight race, and in the case of any voting irregularities, he’s currently poised to be in charge of his own investigation. The state’s current governor, another Republican and the man Kobach narrowly defeated in the primary, has issued a call for Kobach to step aside from his election overseer duties and warned of voter suppression. If this sounds familiar, it’s because the same exact scenario is playing out in Georgia, where Republican Secretary of State Brian Kemp is trying to fend off Stacey Abrams and similar shenanigans are playing out across the state. Kobach is also known for his calls for stronger voter ID laws in the United States and a Muslim registry. He has made claims about the extent of voter fraud in the United States that studies and fact-checkers have concluded are false or unsubstantiated. s Secretary of State of Kansas, Kobach implemented some of the strictest voter identification laws in the United States and fought to remove nearly 20,000 registered voters from the state’s voter rolls. Following considerable investigation and prosecution, Kobach secured nine convictions for voter fraud; all were cases of double voting, and most involved voters who had misunderstood their voting rights. He seems to be the source of Trump’s claim that he lost the popular vote because of illegal immigrants voting, and he was in charge of an ill-fated voter fraud commission requested by Trump. It should be no surprise that the president has campaigned for him this year in Kansas. As Splinter pointed out in August, a federal judge even ordered Kobach, a lawyer, to take six hours of “continuing education” about Kansas law after that judge struck down Kobach’s attempt to require proof of citizenship at the polls. 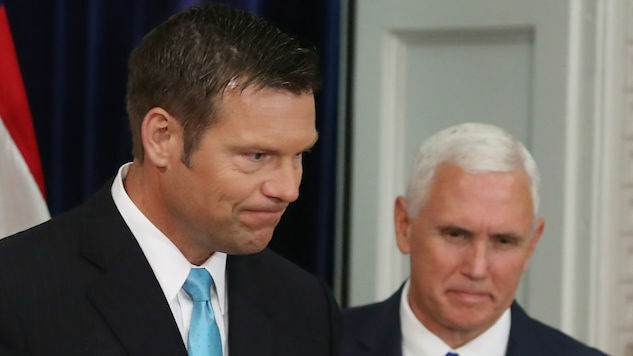 Kobach: So if you like photo ID you’re trying to stop people of color from voting? That’s how you have to deal with Republican “errr, we’re just trying to the right thing!” nonsense. Call it out for what it is—the reason the GOP pursues voter ID laws, or any kind of voting reform, is always to prevent Democrats from voting, and the shortcut they’ve discovered is to target minorities. Too often, on this issue and all others, the “liberal” representative on cable news treats the conservative with kid gloves, and the truth gets lost in attempts at civility that are never reciprocated. Toobin’s reaction is a blueprint for others to follow. Polls show that Kobach is neck-and-neck with Democratic candidate Laura Kelly.